I was irritated how Krisflyer’s fuel surcharge for an award ticket was more expensive than a full budget airline non promotional ticket, so I thought I’ll switch to United Airline’s MilagePlus. Didn’t work! Can’t input my points. So looks like its back to trusty old krisflyer. Another work trip so soon and late work day just before the flight. Sophia already told grandpa “cannot see mama and grandaunt” before she slept. Grandaunt was also travelling. Guess she knows we’re away. Now I regret extending the business trip for travel. I should have just rushed back to see my baby while she needs me. This post is long overdue seeing as the playdate was almost a month ago and we’re going to have our third playdate with this bunch of adorable babies this saturday. All the other babies in this group are about 3 months younger than Sophia but she’s possibly the smallest in size there. Or second smallest. What's this place and who are these people, mummy? One cute thing we observed was herd instinct among the babies. 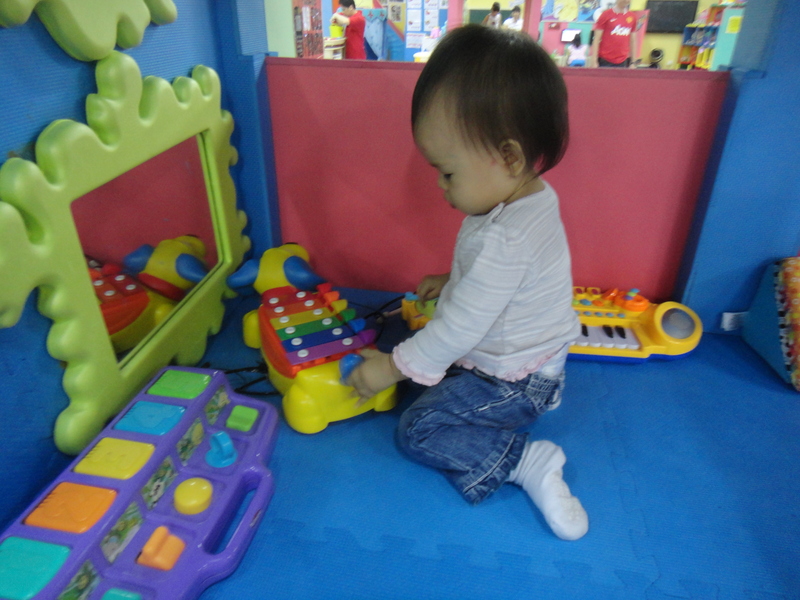 Quite often when one baby is playing with a toy, particularly if said toy is big, makes sounds and have blinking lights, all other babies are attracted and want a piece of that toy. Even though there are clearly more than enough toys to go around. Its great to be able to meet up with this bunch of working mums once a forthnight to share our stories, concerns and finds. Loving the conversation and the social opportunities for baby as well. Sophia joined Luke and Izzy at the second working mums’ play date (which reminds me, I need to blog about play date number 1) at Royce Kids’ Gym today. 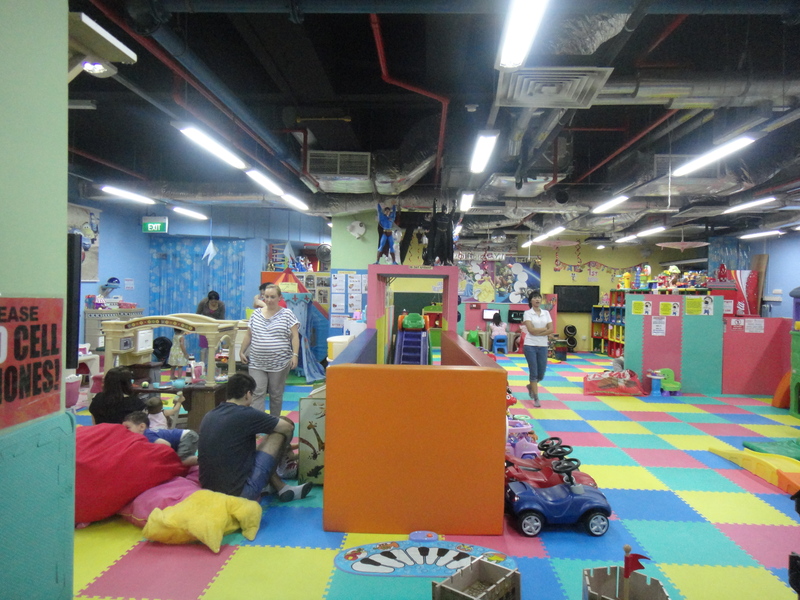 It was unlike any other play gym in that it had far more things that an infant or very young toddler could enjoy. There were tonnes of brightly coloured toys all over and some slopes and swings and hammocks. 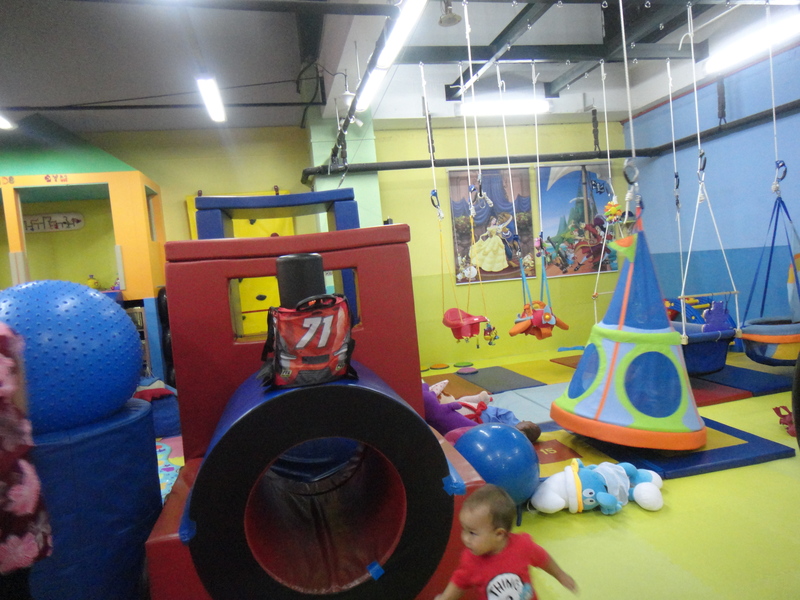 Its not as futuristic or clean or sophisticated as say the Petite Park but I dare say its more fun for Sophia and other kids at around the 8 months to 3 years age group. Older kids may find it not exciting enough. I’ll stop here and let the pictures speak for themselves. On a separate note, we learnt today that baby Luke is now sleeping very well through the night and napping well in the day and is a much happier baby as a result and its all thanks to just one session with the Baby Sleep Fairy and following her advice. I’m mighty impressed. Out of the blue, the opportunity to be involved in the setting up of a Kindergarten adopting the Reggio Emilia approach landed on my lap. I grabbed it. Now, before we get too excited, its probably going to be a very small role. 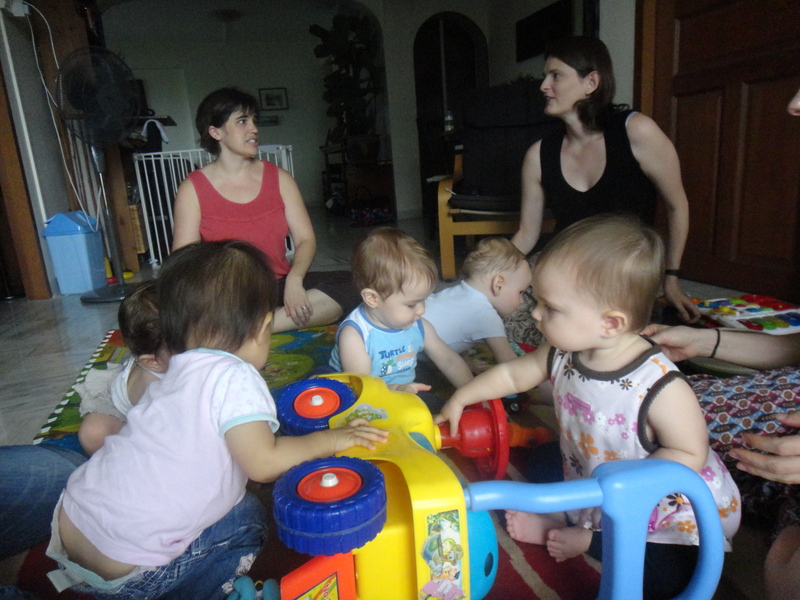 There are already experts in running childcare centres and RE trainers involved. Financial sponsors are also nearly all in place. I really just need to be the coordinator since I’m the one with no skill and no money. I’m really really excited about this project. As evident in some of my earlier posts, I was searching for preschools for Sophia and so far none have been fully satisfactory. Among those that I looked at, the ones adopting Reggio inspired approaches appealed to me but at the end of the day they would be lacking in certain aspects. I first heard about this method through reading the website of The Blue House Nursery, which my sister told me about. She was very drawn to this nursery but my reaction was lukewarm because all their teachers seem non-local, which is fine, but none seemed to be froma chinese speaking background. Which is just a dealbreaker for me because much as I like the reggio approach, billingual exposure is much more important to me. The window before 7 is such an important window for linguistic development beyond which I am a stong believer that one can learn a language well enough to be proficient but certainly not fluent. As a result I did not even make enquiries at The Blue House. The next time I stumbled upon the website of a Reggio Emilia inspired school I really liked what I saw. On paper. The said school was Between 2 Trees set up by a lawyer and a lady with designing background. The teachers all have degrees, not just diplomas. The curriculum was very fluid depending on where the conversation brings the class. There was a lot of emphasis on art and creating an environment which inspires creativity. I thought I struck jackpot. I made an appointment to visit the school with high hopes. I wouldn’t say my hopes were dashed but it could be because I visited at a bad time where most children have already gone home and some were taking their afternoon nap, the school felt lifeless. We were brought around and we saw more good stuff. Classrooms set up for pretend play where shoes are contributed by families so that children can pretend to be mother, father, children etc and wear the corresponding shoes then playact in the mock kitchen. We saw models of owls done by the children. We saw a bunch of children playing with clay. The lighting was turned down because it was wind down time before nap. And the best part was, there was an art material room with rows and rows of raw material for artwork, not all professional art material, most collected from everywhere like ice cream sticks, buttons etc. It was a creative child’s dream come true. My brain fericiously wanted to like this school. My heart strongly refused to. The only logical reason I could give for rejecting the school was they allowed the auntie who cooked for the children to be part of the clay session and the Auntie was saying things like “ni-ni” (nice nice) to them. But surely learning to interact with the old is part of the learning process so I can’t fault them for it. No reason but I just didn’t quite like the vibe of the school. Blame it on bad timing I suppose. And so the search continues. Now its not that I’m tied to the Reggio Emilia approach. I’m just generally drawn to any approach that allows young children freedom to bloom and grow. Play based approach, project based approach etc all appeal to me. Worksheets, montessori, not so. Approaches that tie children to pre-set tasks doesn’t quite work in my short experience as a mum. A few of the mummies I know raved about the Glenn Doman books and flashcards so I read a few of his books and invested in a combination of store bought and homemade flashcards. The Glenn Doman methodology is rather military style forcing information down babies throat imho and while I managed to do it when Sophia was largely immobile, the moment she could run away from it, she did. So teh flashcards were dropped and instead she was allowed to roam around the house. Strangely (or perhaps this is actually normal) she prefers to roam to the her row of books on the bookshelf (second from the bottom so perfect height for her when standing up) and start pulling books out. So as she pulls a book out we open and read it to her. Surprisingly, she remembers things from her first words book whereas for flashcards its really short term memory. If we force her to look at 2 flashcards and immediately afterwards quiz her about them she points to the correct card. But I’m not convinced it would work if we ask a week later. On the other hand, the book knowledge seems permanent. Perhaps this is the difference between self directed learning and forced learning. So there. I am sort of, accidentally, applying a sort-of Reggio inspired appraoch at home and am now sort of involved in setting up a Reggio inspired preschool. I hope it becomes a success in that it grooms confident, intelligent individuals. Perhaps I’ll think about sending Sophia there instead of the other premium schools I’m considering. But since I have so little say in how the school is shaped, I’ll need to evaluate it as it develops. Very excited to be given the chance to participate nevertheless. Glad that its not just the high income that gets to send their children to inspired preschool programmes like these. I’ve been bitten by the baking bug these days and extra time at night has been spent baking rather than uploading photos. I’m sorry. I’ve also been hit by a persistent dry cough and a stomach upset from eating the very popular tom yum sliced fish noodle on phillip street, the coffeeshop next to the equally popular duck rice place. As a result I’ve been exhausted. And I haven’t bought a present for Sophia’s cousin whose birthday party is this weekend. I better come up with something good quick! On a happier note, Sophia has been growing so well. She can now stand and walk holding on to things very well. And Gong Gong apparently has been showing her the animal flashcards a lot because she keeps pulling them out from the bookshelf. She can now identify the common animals (common as in apearing frequently in her books and toys) like lion, giraffe, bear (favourite), dog, cat, rabbit etc. And she screams really loudly when she sees the koala bear. Now I can’t imagine bringing her to the zoo. She’ll probably be noisier than the monkeys. I really can’t wait for her to start speaking in proper words. She’s still stuck at bear (clearer than before, sounding like bea rather than bar), mum-mum (which is not technically a word and which she says only when she’s really really hungry), ma ma (only when she really wants something from mummy) and bird (which sounds like “boar” but we know she means bird because she says it animated whenever she sees a bird). There’s also ‘ta ta ta ta” which apparently has no english equivalent but is an expression of excitement, like when she sees a video of all the dogs at K9 campus. I wonder whether I should start her on baby sign language but I think she has already used up the most important one (milk) for “twinkle twinkle little star”. And grandma is trying to teach her “smelly” to indicate that she has pooped but it looks too much like bye-bye to me. Oh and her “come over” and “hello” looks like bye-bye too. Its all in all too confusing for me. Anyway, it may be good that she can’t express herself properly yet. Then I can pretend not to know that she wants a share of the ice cream we’re happily eating! No, my boss does not read/know about this blog. This is not a butter up my boss attempt. Its just that I just received a cold call from a headhunter and these calls always make me reflect about my existing position and whether its worth staying knowing that there are also many options out there. I am glad that for the past few calls I have always concluded that it is. Of course, it doesn’t help that this particular headhunter really put me off. I have no idea how he got my work number given that, unlike when I was in private practice, my profile is not really out there in the open. All he could say was that its a higher position than my current as “compliance manager” (not true) and higher comp. Its beyond obvious that he was just shooting from the hip. But anyway, this call made me think about my current position and I really don’t have much to complain. The hours are generally really stable 9 – 6, with only the odd days where I have to stay a bit later for a closing and even those days are not as late as what I used to be doing. Compensation is reasonable, I can probably get more in private practice especially if I do ever make equity partner but seriously, which mum needs that kind of work commitment. I am firmly of the view that being a good law firm partner is incompatible with being a good mum. My current job enables me to be a competent mum while bringing home enough for us to live comfortably. And I’m contented with that. Recently my mum has been asking me about “the money that government gives upon having a baby”, which prompted me to do some research. I do hope they don’t have a change in policy anytime soon, which was what happened to me as a kid. When I was born the government was saying “stop at 2”, so my parents went all the way and stopped at 1. What do you know, at the precise time I was applying for primary school, they decided “3 or more if you can afford it” was the way to go. I ended up in last priority in primary school admissions and had to go to a school that nobody wanted to go to. It all worked out fine in the end but I could just as easily have been led astray as a result of going to a crappy school. Anyway, I digress. School admission was a different topic for a different day. Today’s topic is $$$$. I’ve listed below the monetary benefits that the Singapore government is dishing out at the moment to encourage more people to have babies. If I’ve missed out anything, do drop me a comment! I’ve heard this term thrown around alright, but I didn’t really know what it was and initially even got it mixed up with the CDA account, which I now understand is a separate creature altogether (see next item). d. the mother is lawfully married to the child’s father. I’m still a little perturbed by the use of the term “up to” on the baby bonus website because it doesn’t then go on to say under what circumstances will parents get less than $4,000. Is it a case of me being too nit-picky about words again and whoever drafting it not really meaning anything with the words “up to”? Or perhaps some parents may not get the full amount if the baby becomes ineligible before the age of 18 months since payment is staggered with payments at 1st month, 6th month, 12th month and 18th month. A one-stop service for joining the Baby Bonus Scheme is available at the birth registration counters at the hospitals and the Immigration & Checkpoints Authority (ICA). The hospitals are Gleneagles Hospital, KK Women’s and Children’s Hospital, Mount Alvernia Hospital, Mount Elizabeth Hospital, National University Hospital, Parkway East Hospital, Raffles Hospital, Singapore General Hospital and Thomson Medical Centre. All children born on or after 17 August 2008 will enjoy Government contributions in the form of a dollar-for-dollar matching for the amount of savings contributed to the child’s Children Development Account (CDA). The CDA is a special savings account that can be opened at any OCBC Bank or Standard Chartered Bank branch for a child who is eligible for CDA. Parents can save in the CDA any time until 31 December in the year your child turns 6 years of age. The savings will be matched up to the cap of $6,000 each for the 1st and 2nd child, $12,000 each for the 3rd and 4th child and $18,000 each for the fifth and subsequent child. The Government will match the savings in the following month. Savings will be recorded the moment they are deposited even if they are utilised before the government matching. The savings in the CDA may be used to pay fees for all children who are attending approved institutions registered with MCYS under the Baby Bonus Scheme. These include child care centres, kindergartens & special education schools registered with the Ministry of Education, and early intervention programmes registered with the National Council of Social Service (NCSS) or the Centre for Enabled Living (CEL). The CDA savings can also be used to purchase MediShield or Medisave-approved private integrated plans for all your children and pay for all your children’s medical-related expenses. These would include consultation fees, treatment fees and prescription costs incurred at healthcare institutions. Does not have an annual income (e.g. salary, NS pay and tax exempt income such as bank interest, dividend and pension. However, scholarship and similar allowances are excluded) exceeding $2,000 in the previous year. With effect from Year of Assessment (YA) 2010 onwards, the income threshold has increased from $2,000 to $4,000. Qualifying Child Relief (QCR) and Handicapped Child Relief are mutually exclusive in each year of assessment. Also, QCR is shared between 2 spouses. A working mother and satisfying all conditions under working mother’s child relief (see below) may claim both QCR and WMCR on the same child. With effect from Year of Assessment (YA) 2009 onwards, the quantum for QCR has increased to $4,000. In addition, the maximum claim allowable for QCR and WMCR has doubled to $50,000 per child. Has a child who is Singapore citizen as at 31 Dec of previous year and satisfied all conditions under qualifying child relief (QCR) or handicapped child relief (HCR). This relief on the same child even if qualifying child relief is already claimed. The amount of working mother’s child relief (WMCR) claimable for each child is based on a specified percentage of the working mother’s earned income corresponding to the child order. For the first child its 15%, second 20%, third and beyond 25% each. Working mothers can claim WMCR up to 100% of their earned income for all her qualifying children. The total amount of QCR/ HCR and WMCR claimable for each child is capped at $50,000. This is not necessarily applicable to all parents but happens to be applicable in my case as I do not currently have a maid but plan to get one to help with household chores while I or my mum takes care of the baby. Woman separated from your husband, divorced or widowed and had children who lived with you and on whom you could claim child relief. This relief can only be used to offset against earned income. Twice the total foreign domestic worker levy paid in the previous year on one foreign maid can be claimed regardless of whether the husband paid the levy. Parenthood tax rebate is used to offset payable income tax and may be shared between spouses based on agreed apportionment. Unutilised parenthood tax rebate can be carried forward until fully utilised. Becomes a Singapore citizen at the time of birth or within 12 months thereafter. Becomes a Singapore citizen at the time of marriage of his natural parents or within 12 months thereafter. From PA 2009 onwards, PTR for the first child is $5,000, second child $10,000 and third child onwards $20,000 each. With this concession, the monthly levy for up to 2 foreign domestic workers drops to $170 as compared to the normal levy of $265. Not carrying on any trade, business, profession, vocation or employment in the previous year. This can be claimed on top of parent relief / handicapped parent relief on the same parent or grandparent if the (handicapped) dependant is able to perform some caregiving activities. This is also on top of foreign maid levy relief, provided the parent or grandparent still help to take care of your children. $3000 can be claimed on just one parent/grandparent. There are other possible concession permutations like taking care of elderly or disabled relatives but I have only listed the ones directly applicable to parenthood.